Your property and the appearance of your facilities speak volumes about you. It is a visitor's first impression of your standards of quality and professionalism. Nothing makes a bigger impact on the attractiveness of your environment than a well-designed, properly maintained landscape. All Green, Inc is uniquely qualified to be your "marketing partner", helping you achieve a first-class image of your property using our landscape services. 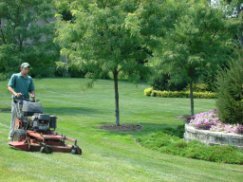 When you entrust your landscape to us, your associates will enjoy coming to an environment that says you care, and your visitors or clients will know at a glance that your property is maintained with the highest standards and attention to detail. We will meet with you to discuss your design and/or maintenance needs. Then we'll make recommendations and provide you with a proposal for your budget. 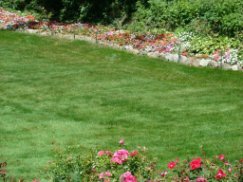 Beyond that, you can attend to your other needs and we'll take care of the planting, mowing, pruning, spraying, edging and fertilizing. You can count on our well-trained, safety conscious, uniformed crews to be reliable, courteous and dependable, folks that you'll be proud to have on your property. We use only the best equipment, properly maintained and impressively clean, because, after all, that's our image and we're very proud of it!